ASUNM advocates for the Legislative Lottery Scholarship. 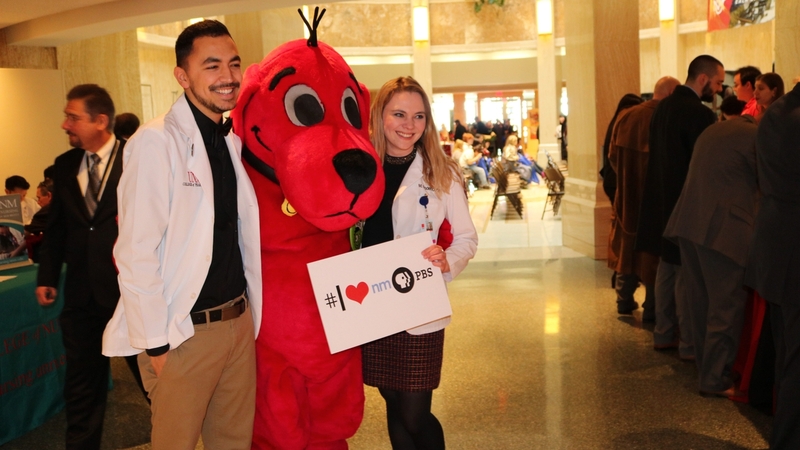 Clifford, The Big Red Dog is always a popular draw at UNM Day at the Legislature. 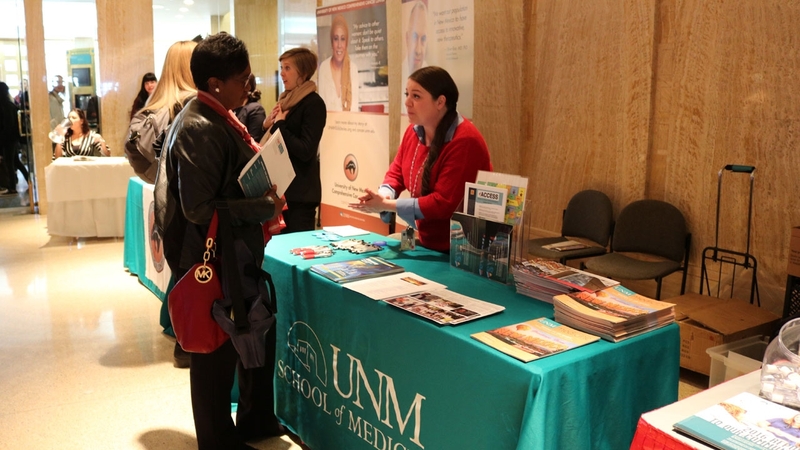 A UNM representative discusses programs available from the UNM School of Medicine. The people of Santa Fe were seeing red on Monday. Dozens of The University of New Mexico’s departments, programs and student groups gathered at the State Capital Building to celebrate all things UNM with legislators and community leaders. UNM Day, is an annual event during the session where a variety of faculty, staff and students converge near the Rotunda to showcase the importance of UNM’s work in the arts, business, community, health, research and more. Performance/Outcomes Funding Formula: Since the funding formula’s implementation six years ago, UNM has risen to meet the challenges of the performance based formula. UNM strongly supports that the current metrics and calculations of the performance based formula be maintained, regardless of the current scal situation. Institutions need to be rewarded for their efforts in improving outcomes for students. Compensation: UNM must compete globally in order to hire and retain quality faculty. Additionally, our faculty and staff have not received a compensation increase in four years. Their take-home pay has been eroded by continuing increases in health care, retirement and the cost-of-living. UNM, therefore, strongly supports fair and equitable compensation packages for all our faculty and staff. Research and Public Service Projects (RPSPs): Research and Public Service Projects have been cut by approximately 9 percent over the past two years. UNM is requesting the restoration of funding for all RPSPs to the FY16 funding level. Legislative Lottery Scholarship: UNM supports solvency of the lottery scholarship fund that is equitable for all students. Capital Outlay: UNM accounts for 48 percent of the state’s total higher education FTEs as well as 32 percent of the total square footage devoted to teaching and research. UNM supports funding capital projects in proportion to an institution’s size and student population. Representatives from the UNM School of Medicine, UNM Cancer Center and College of Nursing also showcased their work. New this year, the College of Pharmacy students hosted a health screening that included testing for atrial fibrillation (AFid) which can detect an irregular heartbeat associated with five times a greater risk for stroke. Over 100 people participated in the health screenings. Other campus participants include New Mexico PBS, ASUNM/GPSA, El Centro de la Raza, Equity and Inclusion, Popejoy Hall, School of Law, UNM Libraries and UNM Press to name a few. Additionally, each branch campus was also represented. Along with the chance to connect with legislators, UNM also connected with community members with interactive exhibits. The School of Engineering displayed quad-copters, from the Department of Electrical and Computer Engineering, built by students in the lab. I-ants, robots from Melanie Moses’ Computer Science lab also entertained the crowd with interactive features. 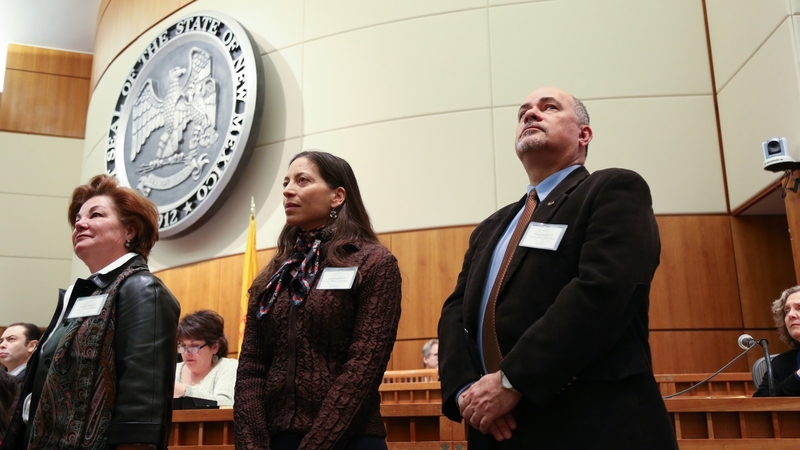 Several faculty members were recognized by legislators for their outstanding achievements. 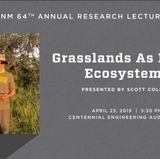 Honorees included Distinguished Professor Plamen Atanassov, chemical and biological engineering; Dr. Cheryl Willman, director and CEO of the UNM Comprehensive Cancer Center; and Professor Jessica Goodkind, Department of Sociology with a secondary appointment in the Department of Psychiatry. Over 40 students met one-on-one with legislators in person to talk about issues affecting students, like the potential cuts to the Legislative Lottery Scholarship. 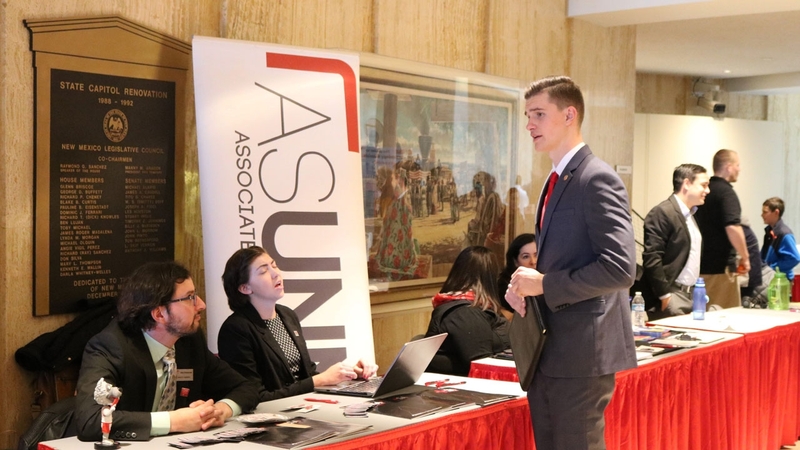 “Today we are advocating for all New Mexican students,” said Noah Brooks, ASUNM president. The session lasts for 30 days, ending at noon on Thursday, Feb. 15. 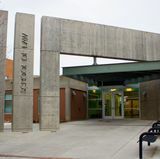 The campus community can follow legislation as it progresses during the session through UNM’s Government Relations website. 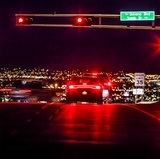 For specific legislation, visit UNM’s Bill Tracker. Daily legislative updates are also available during the session. Interested individuals can subscribe to receive updates.